​AXI’s Enclosed Automated Intelligent Fuel Maintenance Systems are programmable and automated self-contained, stand-alone fuel filtration, separation, and conditioning systems. An STS system will remove and prevent the buildup of water, sludge, and contaminants in tanks while eliminating and preventing microbial contamination. The STS systems that are capable of maintaining multiple tanks with a single system are the STS 6010, 7004, 7010, 7030, and 7040. Adding an STS system will optimize and maintain diesel and biofuels, providing maximum sustainability. With flow rates ranging from 2.5 to 300 gallons per minute, and filtration down to 1 micron, STS systems are ideal for bulk storage tanks for usage in backup power and ready-use applications. 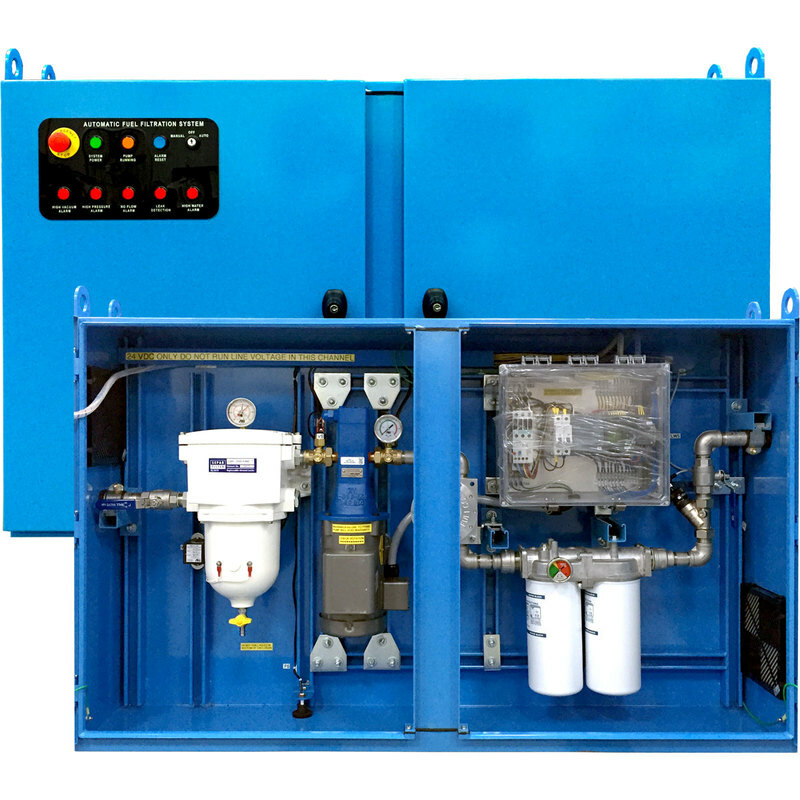 The STS 6000 and STS 7000 Series are self-contained, stand-alone, and fully automated systems that optimize diesel fuel quality, guaranteeing the integrity of stored diesel fuel. The STS 7000 Series has the capability of adding an Auto Water Drain and Multi Tank option. AXI’s FPS line of intelligent fuel maintenance systems are compact versions of the STS system without an enclosure. These compact fuel maintenance systems are specifically designed for permanent installations where space and/or indoor use is a factor, such as inside gen-set enclosures or marine applications. 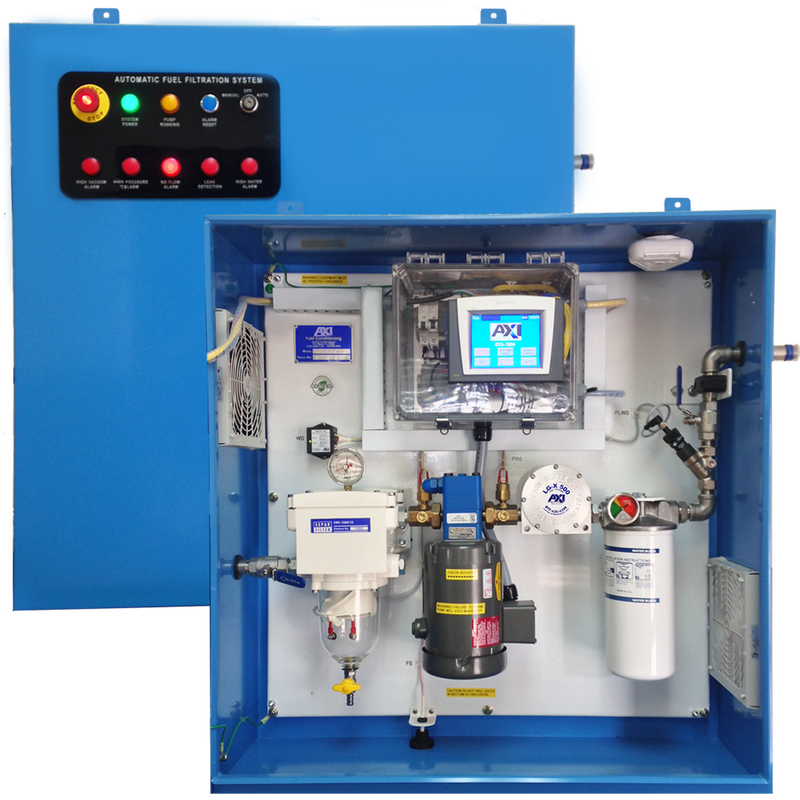 FPS systems have a flow rate that ranges from 80 to 600 gallons per hour, making it the ideal solution for a wide variety of applications. The AXI Intelligent Fuel Port is capable of managing fuel distribution for multiple tanks. The System Automation Controller can manage up to four (4) fuel tanks (Smart-Comm – two (2) tanks, Net-Comm – Up to six (6) tanks). By utilizing actuated valves, the controller can distribute fuel to the appropriate tank, while monitoring respective tank levels.